This blog entry about the events of Friday, January 06, 2012 was originally posted on January 12, 2012. DAY 9 (PART 1): “We are lucky he is a small man,” said the Ugandan man sitting next to me on the Jaguar bus coach to Kigali, Rwanda. While the Jaguar bus company was branded as an “executive coach” with a ripped off logo of the luxury car manufacturer, it wasn’t more than a crowded Greyhound bus in the States. In fact, to pack more people in, they had squeezed another line of chairs in the aisle, making it rows of two seats on the left, and three on the right, with not much aisle space to walk down — although that was filled with baggage at times too. I was sitting in the aisle seat of the three-seater, with the guy next to me concerned about the size of person who’d get the window, but it seemed we’d be okay for the long run. I’d just come back to Kampala from the jungle of the Budongo Forest Reserve, and already I was on the road to get to Rwanda in time for my scheduled gorilla trek — I’d booked the specific date weeks ago, since the Rwanda Development Board (RDB) only gives out a limited 80 gorilla permits per day. It was dark by the time we departed Kampala a little passed 8 p.m. — buses leave roughly on schedule in this part of Africa — and it was a smooth ride while the asphalt lasted. Music videos were shown on the monitor at front, playing a rotation of local artists, plus favorites Rihanna and Akon. The seats were glittering with the lights of different cell phones — Blackberrys and a lot of Android phones, although Maggie had told me that the penetration rate of the iPhone in Uganda is 80%. Most people kept to themselves, listening to music, texting, or dozing off — which is what I did since this was to be my place to sleep for the night, except for the one pitstop we made to refuel and use the toilet. I was conscious of my backpack in the overhead bin — it held about $4k worth of computer and photography equipment — but I remembered my own advice: People won’t have reason to believe you have valuable things if you don’t reveal that you do. 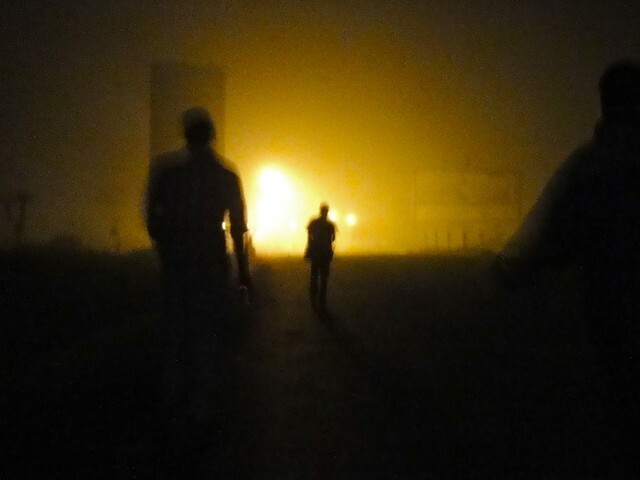 It was about three in the morning when the bus arrived at the border with Rwanda. Fortunately I was only in the third row of the bus and could get to the immigration lines before most of the bus, which gave me a little breathing room to think — although the exit formalities were pretty straightforward. I got my exit stamp and then walked down the dark road over the border (picture above) and into the country of Rwanda. Funny, it’s like we’re refugees going into Rwanda, not the other way around, I thought. Also, This reminds me of a zombie movie. The “small man” borrowed a pen from me at the immigration office on the other side, while I waited to get my fingerprints scanned. Many visitors need visas to enter Rwanda — unless you’re from the U.S., Canada, and only a select few European, Asian, and African countries — but for me, it was an easy affair. I lined up back at the bus where all our bags had been left in the road for inspection; I claimed my big bag, opened it for an inspection to an officer — careful not to reveal any plastic bags since they are banned in Rwanda — and put it back on the bus. I was about to re-board the bus scott-free when a man tapped me. “Your bag,” he pointed out. “[If you put it in the bus, it’s there. ]” Sitting in the middle of the road was the backpack — with all my electronic equipment, camera and lenses — looking not so obvious. If anyone knew what was in there. I grabbed it, had it inspected, and got back on the bus. Whew, that could have been bad, I thought, thanking the man. Later on the “small man” reboarded and gave me back my pen. Ugandans and Rwandans got my back. WITH WATCHES TURNED BACK AN HOUR due to the time zone shift, the Jaguar coach continued on the right side of the road and drove the rest of the way to Rwanda’s capital, Kigali. It was still dark when we arrived at the bus terminal — about four in the morning — and I decided that I’d wait for daybreak to do anything. And so I sat on a bench near an unopened forex office in the bus terminal and just wrote on my iPhone, unbothered. Like Uganda (but unlike many other countries I’d been to in the world), no one really bothers you even if you’re an obvious looking tourist. Sure, some may approach you for a taxi, or some other offer, but a simple “no” and they politely go away like magic. Dawn arrived and the terminal got busier and busier. The forex office opened and I simply stood up and exchanged all my leftover Ugandan schillings into Rwandan francs. I debated checking into a hostel or cheap hotel near the city center, but I decided to wait for any information I’d get from the RDB office, where I had to collect my gorilla permit to go trekking the following morning. When the city was more awake around 7, I took my bags and hopped on the back of a taxi-moto — helmet on — towards the RDB office away from the urban center. Riding around town, my initial impressions of Kigali were positive; it’s a stunning and very clean city situated in the “land of a thousand hills.” The roads are almost empty with only a few cars and motorbikes on the streets — streets adorned with flowers and manicured foliage — another contrast to the heavy congestion of dusty Kampala. I arrived at the RDB office about an hour too early — they officially opened on weekends at 8 — but thankfully the security guys let me sit at their desk. It was there that I watched the cleaning crew come in, and one guy smugly did a demo of how to use the floor washer. IF YOU RECALL THE PROLOGUE ENTRY of this trip, I had emailed a guy that I only knew by “Norbert,” who organized the gorilla permits for the RDB. Our email trail over the past few weeks was fairly professional — until this one email where he asked me if it was possible for him to wire me money so that I could get a used iPhone for him off of Craiglist and bring it to him, like some sort of technology mule. Obviously I thought the request was weird, and I didn’t have time to get one in time after his request anyway. Maggie had organized her Rwandan gorilla permit with the same “Norbert” and describe him as a weird guy; he was busy on Facebook when she had arrived a few weeks prior. With that in mind, I didn’t know what to expect when I met him, but at least I felt confident that I would in fact get a gorilla permit, and wiring the money to Africa was not a scam. Erik (text message at 8:15): Hi Norbert, it’s Erik the journalist from the US. I had to take an early bus and am already at RDB this morning for the permit, etc. He led me to the tourism office, took off his cap, and powered up his laptop — Pitbull was playing. All that aside, he was professional at everything else — even having only been there for 6 months after graduating from Ohio State — setting me up with my gorilla permit the next day, giving me contacts for organizing a trip on the new Congo-Nile Trail after gorilla trekking, and suggesting where I should stay for the night. I asked him if I should get a place in town, or if I should get up to Musanze, the base town for treks into the mountain rainforest of northwestern Rwanda. He recommended a place near the entrance of the national park, and called them so I could make a reservation. Our moment was short lived, but at least I finally got to put a face to a name. With all his help, I sort of wished I had gotten him that iPhone. ANOTHER RUSH. I took a moto back through Kigali’s hills to the bus station where I had just arrived from. A quick chicken, pea, and potato stew at a local cyber café/restaurant and I was off on a Virungas company minibus to the jungle again. Kigali’s rolling hills extended out to the rest of the countryside , many of which had been made into agricultural terraces like those in the Philippines (although not as big). The bus drove the 90 minutes to Musanze in the north and dropped us off in a dusty lot where I grabbed my bags, not knowing exactly where to go, only that the Kinigi Guesthouse was another 15 km away on a moto-taxi from the town center. One guy approached me for any solicitation. He offered a currency exchange bureau, which I didn’t immediately need. Then he offered a car rental; everyone going gorilla trekking is required to have a car to get to the trailhead — although Norbert told me that you just meet people at the guesthouse and organize a share. I declined and only asked for an internet cafe, which he brought me too, and then went away when I told him I would just take a boda up to mountains (technically volcanoes).